What does the Bible say about worship? Find out what the Bible teaches about the importance of worship. The following verses can be used for personal devotion or Bible study. 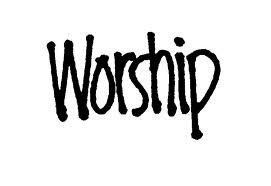 The following compilation provides a biblical concept of worship. Feel free to use the list for personal use or group lesson material. Please keep in mind that these verses are taken out of the original context. In order to gain a better understanding of the intended meaning I would encourage you to study each passage thoroughly. A careful systematic study ensures accurate interpretation of the biblical text. Splendor and majesty are before him; strength and joy in his dwelling place. Ascribe to the LORD, O families of nations, ascribe to the LORD glory and strength, ascribe to the LORD the glory due his name. Bring an offering and come before him; worship the LORD in the splendor of his holiness. "Hear this, you kings! Listen, you rulers! I will sing to the LORD, I will sing; I will make music to the LORD, the God of Israel." When the men were returning home after David had killed the Philistine, the women came out from all the towns of Israel to meet King Saul with singing and dancing, with joyful songs and with tambourines and lutes. 7 As they danced, they sang: "Saul has slain his thousands, and David his tens of thousands." When those who were carrying the ark of the LORD had taken six steps, he sacrificed a bull and a fattened calf. David, wearing a linen ephod, danced before the LORD with all his might, while he and the entire house of Israel brought up the ark of the LORD with shouts and the sound of trumpets. As the ark of the LORD was entering the City of David, Michal daughter of Saul watched from a window. And when she saw King David leaping and dancing before the LORD, she despised him in her heart. They brought the ark of the LORD and set it in its place inside the tent that David had pitched for it, and David sacrificed burnt offerings and fellowship offerings before the LORD. When David returned home to bless his household, Michal daughter of Saul came out to meet him and said, "How the king of Israel has distinguished himself today, disrobing in the sight of the slave girls of his servants as any vulgar fellow would!" David said to Michal, "It was before the LORD, who chose me rather than your father or anyone from his house when he appointed me ruler over the LORD's people Israel—I will celebrate before the LORD. I will become even more undignified than this, and I will be humiliated in my own eyes. But by these slave girls you spoke of, I will be held in honor." Shout for joy to the LORD, all the earth. Worship the LORD with gladness; come before him with joyful songs. Know that the LORD is God. It is he who made us, and we are his we are his people, the sheep of his pasture. Enter his gates with thanksgiving and his courts with praise; give thanks to him and praise his name. For the LORD is good and his love endures forever; his faithfulness continues through all generations. Praise the LORD. Praise God in his sanctuary; praise him in his mighty heavens. Praise him for his acts of power; praise him for his surpassing greatness. Praise him with the sounding of the trumpet, praise him with the harp and lyre, praise him withtambourine and dancing, praise him with the strings and flute, praise him with the clash of cymbals, praise him with resounding cymbals. Let everything that has breath praise the LORD. Praise the LORD.